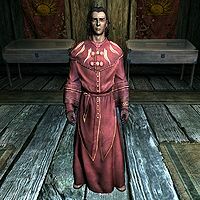 Silus Vesuius, an Imperial destruction mage, is a citizen of Dawnstar and the curator of the Museum of the Mythic Dawn, which is just a few artifacts and objects relating to the Mythic Dawn in display cases inside his home. The reason he created the museum is because he is a part of the family bloodline which was a part of the Mythic Dawn, a cult which attempted to bring the Daedric Prince Mehrunes Dagon to Tamriel, during the Oblivion Crisis 200 years earlier. Talking to him completes a quest to visit the museum, received via a courier's note. He speaks reverently of the Mythic Dawn, despite their insidious background, and asks you collect the pieces of the dismantled Mehrunes' Razor, a powerful weapon. Despite being a proud descendant of a Mythic Dawn agent and an expert in lore surrounding Mehrunes Dagon, his plan to restore Mehrunes' Razor begins to flounder. Upon gathering the pieces you will travel with Silus to a nearby shrine to the Daedric Prince where Silus attempts to summon him, in vain. But when you try to summon Mehrunes Dagon, he reveals that he has no interest in helping Silus repair the Razor at all and that Silus' life must be taken if the Razor is to be restored, prompting a brief fight between you and Silus. After Silus' death, the Prince of Destruction gladly repairs the blade as well as "testing" your strength. However, if you decide to spare Silus, Dagon summons two Dremora to dispatch him. If you defeat them before they kill him, he will return to his museum with the shards of the razor, and will remain friendly to you although access to the razor will be denied to you forever onward. Silus wears Mythic Dawn robes, a pair of Mythic Dawn gloves, and a pair of Mythic Dawn boots. He is equipped with a leveled dagger which can be up to glass quality, and carries a selection of upper-class loot and gold. Visit the museum in Dawnstar: Visit the museum in Dawnstar. Editor ids suggest that Silus was originally going to be named Valmir, though that name was actually given to an unrelated NPC. This page was last modified on 5 February 2017, at 03:57.